This year, Valentine's Day was different than usual. For one thing, Dan was in town :) That always helps! I put more effort into it for Dan and my kids than I usually do, and I think we all ended up enjoying the day. Here are a few highlights. 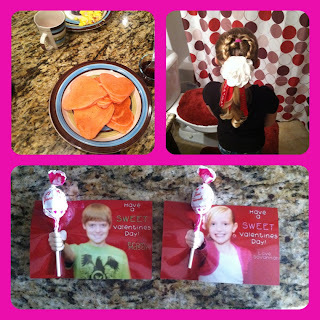 Prior to Valentines day, the kids and I made homemade valentines for their classes. We took a picture of each of them with their fist extended out in front of their faces, in front of one of my red backdrops. Then we bought suckers and stuck the stick through their fist so it looked as if they were actually holding the suckers (see pictures). We used Photoshop to add words (They said "Have a sweet Valentines Day! Love, Savannah/Mason"). I made breakfast for the kids- Pink, heart shaped pancakes with berry syrup, eggs and bacon. After that, I did Savannah's hair in a heart shaped do with red and white "I love you ribbons (see picture above). In their lunches, I surprised them with a small box of chocolates. I gave the 2 little ones their own box of chocolates to enjoy during the day. For Daniel, I went out and bought 15 different helium balloons (one for each year we have been together). I made 15 envelopes out of red paper and wrote a note to stick in each envelope. Each one was a memory we have shared together. I tied the envelopes to the balloons and put them all over our room. I also had a couple of bottles of sparkling cider and a few small gifts for him. Daniel got me a box of chocolates (I love chocolate more than any sane person should) and I'll be painfully honest and admit I ate the whole box, by myself, in 24 hours. He also gave me beautiful flowers. Every one of us enjoyed the day and felt loved. What could be better than that?